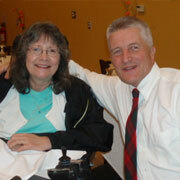 Sandy & I have been part of Newark Community Church since 2001. I’m so happy to be part of the Body of Christ that is making disciples of all nations right here in Newark! But we have so much work ahead of us—it is our prayer that the NCC as a body will continue to be shaped by Jesus Christ to be a place where new believers come to be nurtured and to grow as we preach the Gospel. I hear the pastors preaching the Gospel so clearly, directly and lovingly and I long for more people to reach our door. I know that this will happen as I pray and personally respond to God’s teaching, reproof, correction, and training in righteousness, so that we can be complete, equipped for every good work. I can only serve if I allow God to discipline me. What a privilege it is to be a servant of the Lord!